Gearing up to hit the trail at your local national park or other hiking spot? If you’re like some pet owners, then you might be planning on taking your dog with you out on the trail. But before loading the dog up in the car, take a moment to consider if you should really bring your pup or not. Are You And The Dog Prepared? Before heading to one of these parks, check the current regulations to make sure that you’re prepared. For instance, you may need a leash of a certain length in order to take your dog on the trails. And if you’re in the UK, then you can enjoy the 15 national parks there with your pup. You can view the rules and regulation for bringing along your favorite four-legged friend on the National Parks UK website. Though you might regularly do 13-mile hikes, consider for a moment if your dog can handle something like that. If you’ve never taken your pup out on trails, then start with some short trails to see how he does out there. Then, gradually work up to longer trails so that you can make sure the dog can handle the trail conditions. And, if you’re intending on putting a pack on the dog, practice with it around the house so that he can get used to carrying around the extra weight. You’ll also want to ensure that you have basic emergency and survival supplies for the dog. Collapsible food and water dishes are a great way to make sure that your dog stays hydrated and nourished while hiking. Also remember to carry enough water to keep both you and your dog hydrated. If the weather is cool, then you’ll also want to consider a dog vest and boots to keep Fido warm out there. Even if it’s not cold outside, the dog boots are a good way to keep the paw pads from getting cut out on the trail. And for rainy days, consider a rain jacket for your dog. 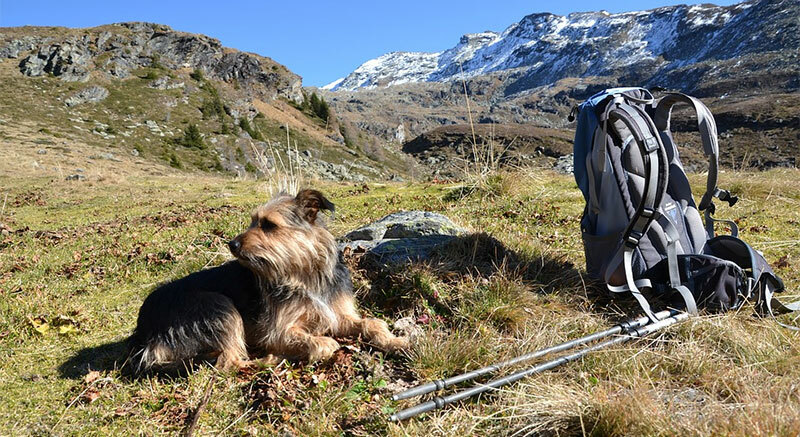 If you’ve found a hiking trail that is dog-friendly, be sure to follow proper etiquette so that it stays that way. This means picking up after your pup instead of leaving dog poop on the trail. You’ll also need to keep your four-legged friend calm when other people and pets pass by you on the trail. If you need to hold your dog to keep him calm, then do so. If you’re unsure how your dog will react to others you might meet on the trail, then consider hiking with your pet in the off-season or on trails that are not frequented by other hikers. Also make sure that you have a study leash before setting out for the hiking trail. This means don’t bring your normal extendable leash. Instead, choose something more durable that is at least 6-feet in length, which is the most common leash requirement at parks in the United States. And in the UK national parks, you’ll need one that is no more than 2-metres long (though requires may vary by park and in Scotland).